I rang in 2012 with my family. There was no wild party, no hats or noisemakers. There was a dance party, but it ended at 8:00 when the 6-year old and 4-year old went to bed. My night was mellow and just what I needed, my brother and his wife, my niece and myself snuggled up in blankets hanging out. And, we played a silly game. We ditched the game-board and went low-maintenance; I read cards full of seemingly random collections of words for everyone else to decipher, kind of like that short-lived game show, Bumper Stumpers where people decoded vanity license plates for loads of cash. We got super hung up on Run Hazel Wig Here. My brother, Justin, must have said those words 3,000 times, emphasizing different syllables, using different accents, different intonations, different paces until finally we solved the puzzle, tears streaming down our faces from laughing so hard. Over and over in my head I could hear my brother’s voice saying those ridiculous words and then the word RESOLUTION popped into my head (it was New Year’s Eve after all). I could hear it all slow-mo-style like when we used to click records down to the 16 setting on Dad’s record player. My 6-year old niece had just proclaimed that she had three resolutions and I thought, whoah, if she’s got three and she’s only six… I should have 18.5 resolutions going into 2012. The pressure was on. The truth is I’ve never been a fan of New Year’s resolutions. Not just because it feels cliche to all of a sudden determine that I will lose weight, stop eating out, floss daily, vacuum more, not wait until my laundry bin has exploded in my closet to actually do the wash, work less, relax more, pay off my credit card, swear less or quit drinking coffee just because the calendar is turning from 12/31 to 1/1. Resolutions make me feel like I’m ending the year focusing on something about myself that just isn’t good enough. Ugh, what a way to break up a good party snugglefest: deliberating over problems. These resolutions I’d been making seemed to be just that: RE–solutions…attempt after attempt after attempt to fix what was wrong with me. What a rotten way to start a new year. Enough of that craziness! Resolutions are soooo 2011! Last January a group of amazing people gathered in my home for a pot-luck dinner. I have the great fortune to have found a small extended family in a group of former students and we gather, along with a teacher/friend, each year over Winter break and Summer break to share time with each other. Last year we took a quiet moment in each other’s company to set an intention for ourselves for the upcoming year; something that we wanted to hope into our lives or into the lives of someone else. Some of us shared with the group, some of us kept our hopes in our own hearts. 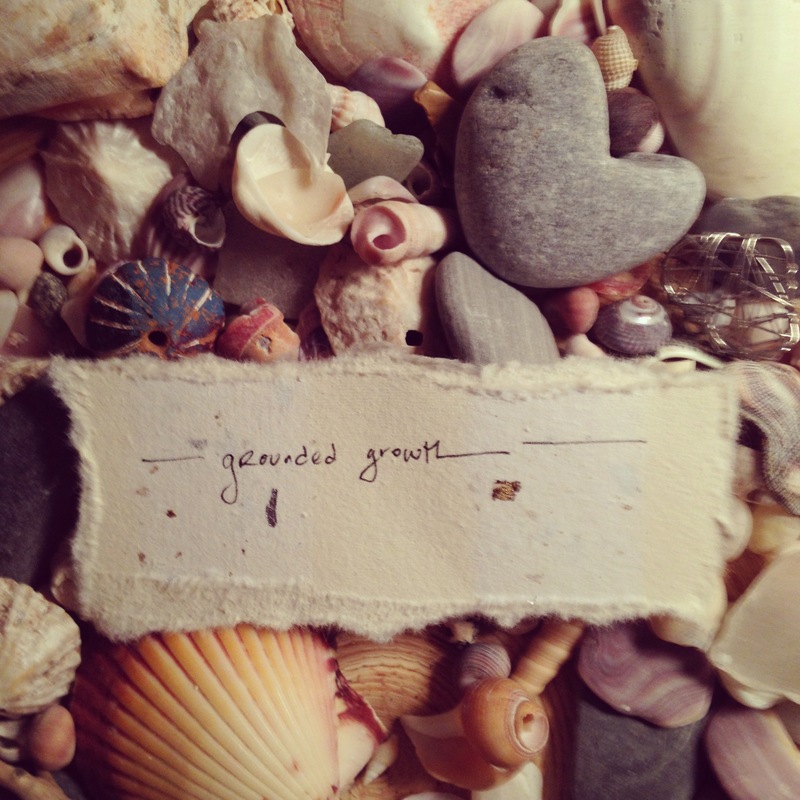 My intention was two simple words: grounded growth. In that moment, I was setting an intention to grow, to expand, to reach out from a place of strength and stability. It had nothing to do with starting a blog. In fact, it wasn’t until that slow-motion resolution word kept echoing in my ears, that moment when I resolved to let go of resolutions and focus, instead, on being at peace with myself and all of my imperfections, that I remembered that scrap of paper. I wrote those words in a room full of friends. In a safe space amongst people with whom I feel beloved for sharing my quirky-random-imperfect self. I had no idea that those words would lead me to start this little adventure of writing and sharing and connecting! I ended 2011 feeling like I had accomplished something that I hadn’t even realized I had set out to do; full of hope and excitement and a feeling that I am enough just as I am. It’s 2012. This year feels special. It’s the year that many of the students from the group I mentioned before will graduate from college. I cannot begin to express how proud I am to bear witness to their growth. It is the year that my current group of kids at school will graduate from high school; I’m not quite sure what I will do without them when they move on! It is the year of my 20th high school reunion. 2012 is the year of all sorts of beginnings and endings and milestones and changes and wonderful moments and adventures and little fabulous gifts that have yet to reveal themselves. This year starts not with problem-focused craziness, but with a quiet thought on all that I would like to bring more of into my life. It’s going to be good. I can feel it. Previous caught in my tin can Next bring on the hamster bubble! Hope to see you in 2012, Susannah! Let’s make it the beginning of 2012!! May it be full of snugglefests and all things good! Denise, you are the coolest. Library snugglefest? Sara! Happy 2012 to you and YES! amazing moments are all around us! It’s January 2 and I’m already sick of the diet that I haven’t quite started yet. Not to get all Miss Cleo on you, but I think this year is going to be pretty damn fabulous for you. Play number 27 for powerball too. I love your Miss Cleo impression! 27 all the way, Little Sheba! Damn the New Year’s resolutions! I like your style. Keep up the wonderful writing. I love your blog Malies. Taking a 5 minute breather from the kids- sitting on the sofa in langebaan- checking to see if you have posted anything new…. and …..yes…you have….better than a meal from Sirtaj!!! JannaJ! I love picturing you sitting in front of the most beautiful coffee table in the world and snuggling up with me for a minute. I wish I was there with you in person! mmmm. just made me want my favorite dish from primi piatti! love you. Nicely put. Instead of resolutions, I like to write down all the things I have done in the past year month by month. It’s nice to look back & take a moment to realize how much you’ve learning and experienced. I love that idea! What a great way to take stock of all of the good stuff. Thanks for stopping by. All the best for a great 2012. 🙂 Love it! Still have my 2011 new years intentions on that awesome paper. You are such an inspiration…I can’t say that enough Glam! Rox! I will always cherish my time with you all…you are my inspiration!